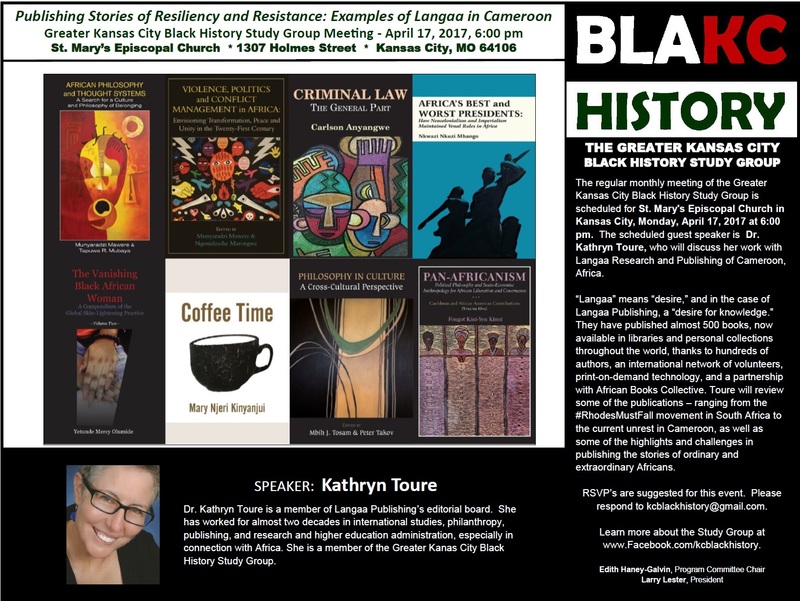 The regular monthly meeting of the Greater Kansas City Black History Study Group is scheduled for St. Mary’s Episcopal Church in Kansas City, Monday, April 17, 2017 at 6:00 pm. The scheduled guest speaker is Dr. Kathryn Toure, who will discuss her work with Langaa Research and Publishing of Cameroon, Africa. “Langaa” means “desire,” and in the case of Langaa Publishing, a “desire for knowledge.” They have published almost 500 books, now available in libraries and personal collections throughout the world, thanks to hundreds of authors, an international network of volunteers, print-on-demand technology, and a partnership with African Books Collective. Toure will review some of the publications – ranging from the #RhodesMustFall movement in South Africa to the current unrest in Cameroon, as well as some of the highlights and challenges in publishing the stories of ordinary and extraordinary Africans. RSVP’s are suggested for this event. Please respond to kcblackhistory@gmail.com. Learn more about the Study Group at kcblackhistory. Thank you letter to Dr. Kathryn Toure for her presentation on Langaa.